The Perspex Wall Bracket has been designed with simplicity and ease at the forfront of the mind and provides you with a safe, practical and space-efficient way of storing your AED. The Perspex range has been designed to embody attractiveness, innovation and adaptability to almost every environment. The particular bracket allows you to store any AED on the market, including the larger ZOLL AEDs and Powerheart G5 devices. This Perspex Wall Bracket is sure to provide your work environment a simple, yet eye catching way of storing your life-saving investment. Simply choose which wall you would like to fix the bracket to and and use the matte fixings provided to install and you’re all set. A Wall Bracket allows for a quick retrieval of the AED in the event of an emergency. For every minute that treatment is delayed, the casualty loses 10% of their survival chance, therefore swift treatment is imperative. 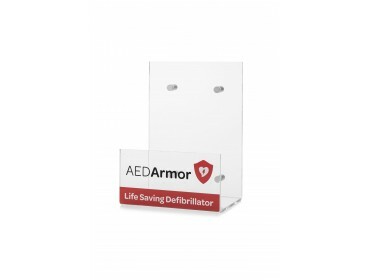 Interested in the AED Armor Perspex Wall Bracket? Think this might be the right storage solution for you? Then it’s time to get in contact with the AED Armor team. To speak to one of our advisors, call 0333 678 0246 and they’ll be happy to share their knowledge with you.